I’m new to this forum and was told about it by Claudia and Patrick. As it is my first attempt to post a subject then do forgive me if it doesn’t work too well. I collect Bing, KBN 00, and Distler 00, but am interested in most tinplate trains. I’ve been collecting since 1984. In December last year I won a KBN train set in the USA, which was delivered in early January. Thanks to the help from Patrick I’ve found that it is the KBN 24mm set no 323. Some of the pieces were damaged, which have since been repaired, but the loco still needs attention. I’ve made many replica Bing 00 boxes so I’ve made a replica KBN box for this set. The only thing I am missing is a good picture of the picture on the box lid. When I received the set I noticed that there were 2 long pieces of track that were 26 cms and 2 shorter pieces that were 18,5 cms, and I couldn’t work out how to use all of the pieces to make a complete circuit. The KBN catalogue of 1928 states that there should only be 3 straights, but the picture of the set shows that they are the short ones. The picture of the 322 set shows the longer lengths. This was confusing. Finally I think I have worked it out. Just for Patrick, ‘I had a cunning plan’. Can anyone in the forum help me out. Am I correct or is there some other way of doing it. Geoff ( from England ). If the pictures don't attach, they are in my gallery. welcome to the forum. I am really looking forward to reading your posts and enjoying pictures of table top railways. i added a picture from your gallery to show you the syntax for the link to the picture. Please use 'bearbeiten' (right at the bottom) to edit your other picture-links. Because of your big pictures, please use carriage return to format your text. Welcome to the forum and congratulations for your new set, splendid! Is it from Ebay? About the straights, how long is te bridge? Maybe bridge plus two shorts equals two long? Welcome to this forum, Geoff! How nice to meet you here again. Congrats to the KBN set. It looks nearly mint. Strange that the box is missing and the items look so well cared. An interesting thing is the station. It's without advertisements - that means it was made for the German/continental market. Could you find out how the set made its way to US? Manuel, as for your question about the bridge, it’s the same length as the longer piece of track which is 26cms. This makes three lengths of 26cms and two of 18,5 cms, a total of 5. This makes it impossible to use all the pieces and make an oval circuit. I have thought about the possibilities and I have a few ideas, but of course it’s only guesswork. My first thought was that there was originally 3 straights, one long and two short. That way you could use the bridge and a short piece on one side, and the second short piece and a long one on the other. That means that the second long piece was an extra. But then I thought, why make two short pieces, why not all 3 of them long pieces? Also, was it possible to buy extra individual pieces of track? Another theory was that a circuit could be made, but not using the bridge, although this would be unlikely. The next confusing issue is the picture of box set 323 in the catalogue. It clearly shows that the straights are short ones. If you look at the straights in box set 322 they do appear longer. If there should be 3 short lengths of 18,5 cms then how do you fit in the bridge which is 26cms. I tried many combinations and the only way I found is shown in in my gallery. 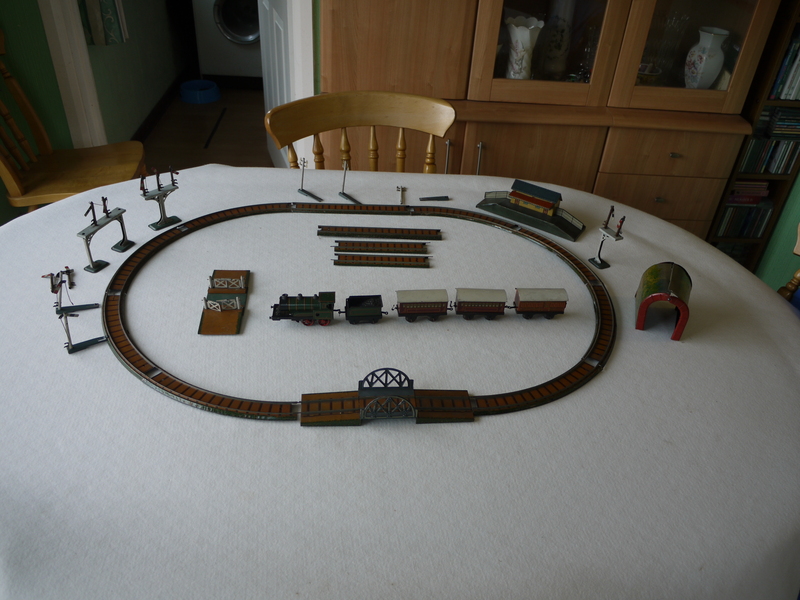 Unfortunately the set came from a true auction, not E Bay, so it will be impossible to trace its history. I hope it gives you all something to think about. Maybe someone has another idea. Whatever the outcome, I’m really pleased to be the owner of a wonderful set! !